Beloved English Children's Book Author Was "Controlling, Difficult, Despised Many People." Apparently an icon of coziness, Alison Uttley's diaries introduce us to a fabulously nasty character. Or, as we call it, sympathetic! 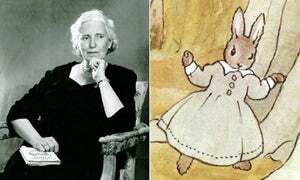 Although not well-known stateside, the "Little Grey Rabbit" books are classics of English children's literature. But like so many famed children's writers, their author was apparently no great lover of humanity. Uttley was very impressive - only the first woman to graduate from Manchester University, with a degree in Physics, she went on to write more than 100 books, and, after her husband's suicide, raise her son as a single mother. Biographers find the contrast between Uttley's scientific background and her lifelong belief in fairies and time travel to be curious; but eccentricity and imagination - and, okay, a touch of crazy - have never been barriers to good children's writing. Uttley was intensely competitive: she hated being compared to Beatrix Potter, whom she didn't consider a real writer; despised her illustrator - "a humourless bore" - and had nothing but scorn for popular children's author Enid Blyton, whom she dismissed as "a woman ogling [the fishmonger], her false teeth, her red lips" provoking Uttley's disgust. Says the editor of the diaries, "Her competitive and passionate nature often clouded her judgment and drastically affected her private and professional life. Though she ended her life as a grande dame of literature, she was acclaimed but never entirely content." That said, who wants to read about someone who's uniformly generous and non-judgmental in her private diaries? And has a little misanthropy ever hurt children's writing? Roald Dahl and Dr. Seuss would say otherwise. If people are shocked that a woman could write sweet stories and still bear grudges, it does Uttley quite a disservice; personally, we like a little complexity.